The other day on my way home from work I was listening to music and daydreaming when my eyes fell on a beer poster. The man on the poster was eating okonomiyaki. My mouth started to water and I knew at that moment that I needed to try to make it at home. I stopped off at the grocery store and bought all the necessary ingredients. Chop up the cabbage and add the flour, water, egg and kimchi and mix everything together well. Spoon the mixture into a frying pan and shape it into a pancake-like shape. Put the slices of pork on top of the okonomiyaki. When the underside appears browned, flip. 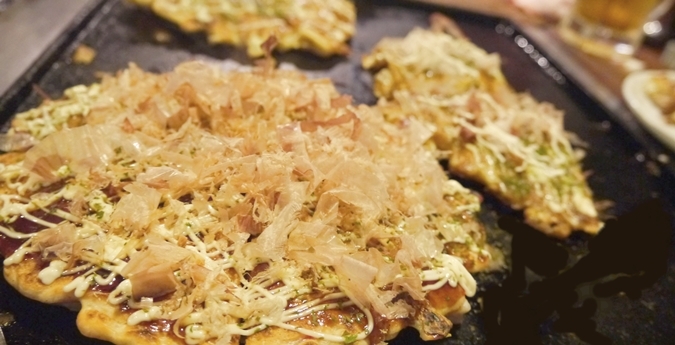 Continue flipping the okonomiyaki until it is cooked through and browned on the outside. Garnish with (in order) okonomiyaki sauce, mayonnaise and dried bonito flakes and enjoy. When I make okonomiyaki at home it reminds me of wandering the streets of Osaka and ducking into the small okonomiyaki shops there to sample the food. Maybe I’ll try making Hiroshima style okonomiyaki next! It’s a Bird. It’s a Plane. It’s a UFO.